Put the coffee beans in a small kraft paper bag and tie it up with a kitchen twine. Just label it to show off the content in it. 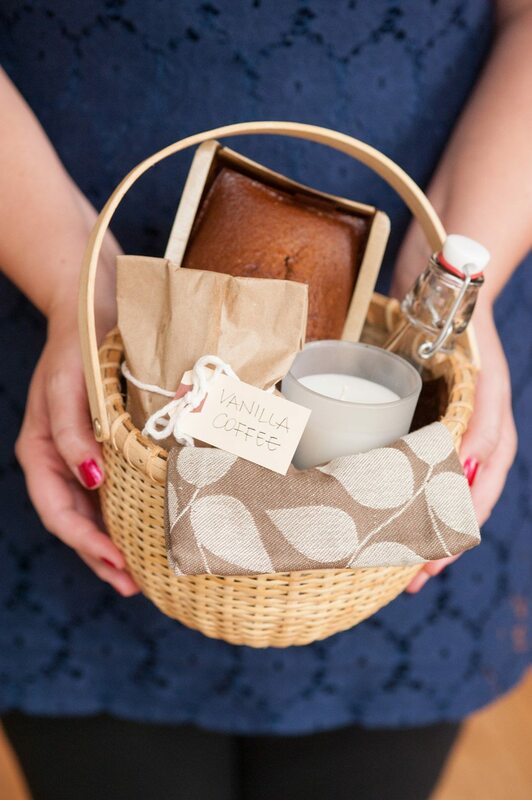 Place the sweet baked treat in a simple box and just add it in the basket. Also place the Prepared vanilla bottles in the basket. A colorchanging candle would just add a glamor quotient to the cute gift basket. All you need is bourbon(or rum will also do), whole vanilla beans and mason jars. Begin by cutting each of the vanilla beans lengthwise and then place them in a jar, three vanilla beans(6 halves) per 1 cup of liquid is the general thumb rule. Cover the vanilla beans with alcohol, shake and lid tightly. Store in a dark place for a couple of weeks may be even upto a month. To gift pour the extract into cute flip-top bottles. Wanna make someone feel really special? Here's the way to it!